González Iñárritu during the production of Biutiful, 2008. 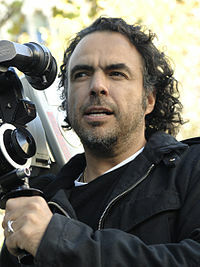 Alejandro González Iñárritu (born August 15, 1963) is an Academy Award-winning Mexican movie director, screenwriter, movie producer, and composer. His five feature movies – Amores perros (2000), 21 Grams (2003), Babel (2006), Biutiful (2010), Birdman or (The Unexpected Virtue of Ignorance) (2014), and The Revenant (2015). He is also close friends with fellow Mexican filmmakers Alfonso Cuarón and Guillermo del Toro, collectively known as "The Three Amigos of Cinema". This page was last changed on 5 March 2018, at 05:07.